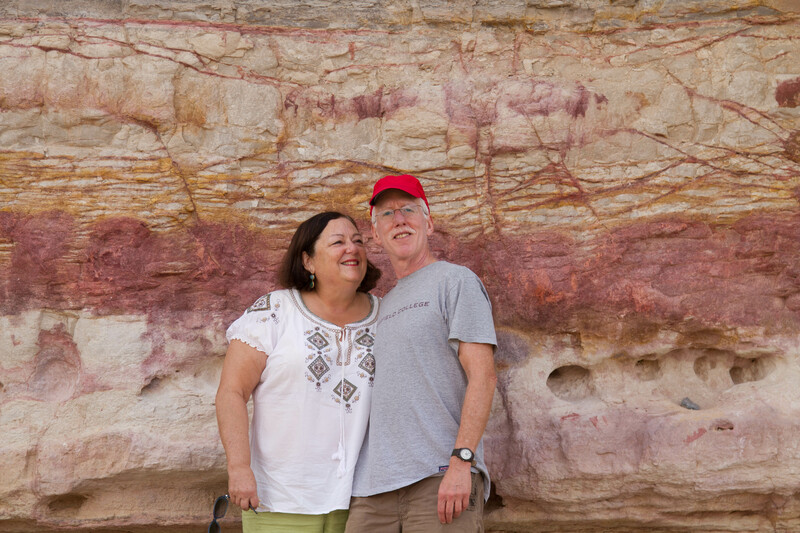 The first time I saw the Negev was in 1969, when my college roommate Mary came to visit in Israel while she was studying in London for the year. We took a bus from Jerusalem to Eilat (the southernmost tip of Israel on the Red Sea) where we slept on the beach for three nights, including one when Eilat was strafed by Jordanian war planes. (Oh my, I was young and adventurous once!) 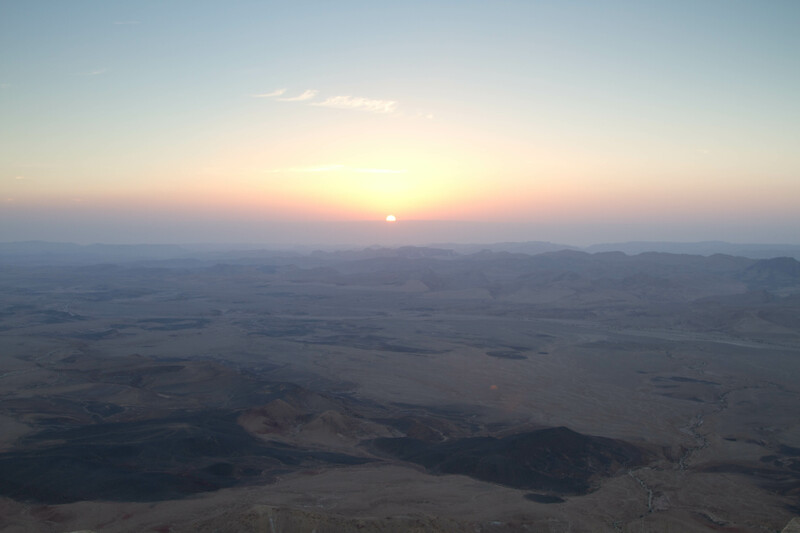 I can still remember how breathtaking it was when the vista of the Negev appeared. It was just how I imagined the moon might look and it was like nothing I had ever seen. Well, that hasn’t changed at all. Here’s how it looks now and here is one of the road signs to give you a sense of what a different world it is. On the way to Maktesh Ramon (more on that later), we stopped at Kibbutz Sde Boker where David Ben Gurion lived and died. We visited his home and the exhibit was much more moving this time than when I saw it years ago. Ben Gurion was the first Prime Minister of Israel and one of the giants of Israel’s founding. in 1953, at age 67, he resigned from the government and went to live on this remote Negev kibbutz, shoveling manure and feeding chickens. He first saw the fledging kibbutz when he went to the Negev to oversee the development of Eilat as an Israeli port. He loved the Negev and had a vision for its development and its importance to the future of Israel that was amazing in its time. He later returned to government, but retired again to Sde Boker and died there. At age 64, my perspective on his move in 1953 is very real and his pioneering spirit combined with his vision and historic leadership are inspiring. Then we were off to Maktesh Ramon. 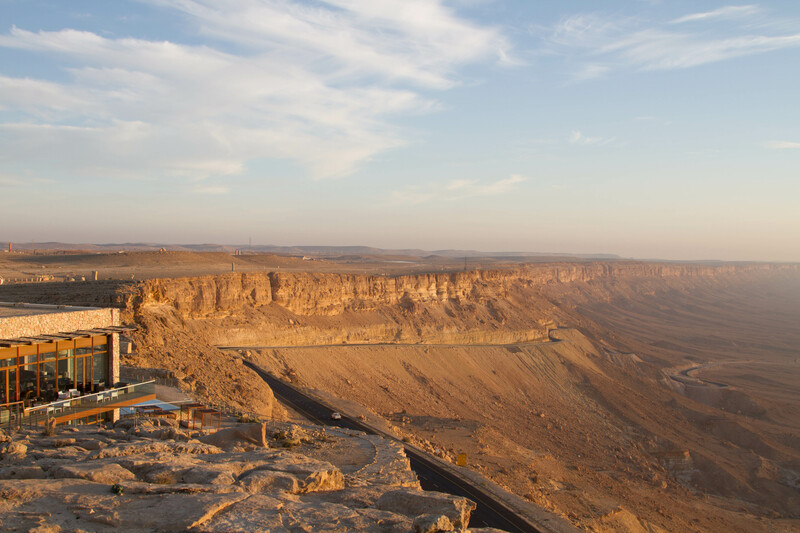 Maktesh Ramon is the largest erosion crater in the world and such formations are only found in the Middle East. In fact Maktesh is the official word in all languages for such a formation. It is 25 miles long and 1,640 ft. deep, has many different kinds and colors of rock, extinct volcanoes, desert fauna and flora and the ruins of a 2000 year old structure that the Nabateans used as they traveled with camel caravans on the Spice Route. In fact, in one spot outside the wall ruins, the ground is black and that was the camel dung heap from 2000 years ago. There is a small town, Mitzpeh Ramon (Viewpoint of Ramon) on its rim, with about 5,000 residents. 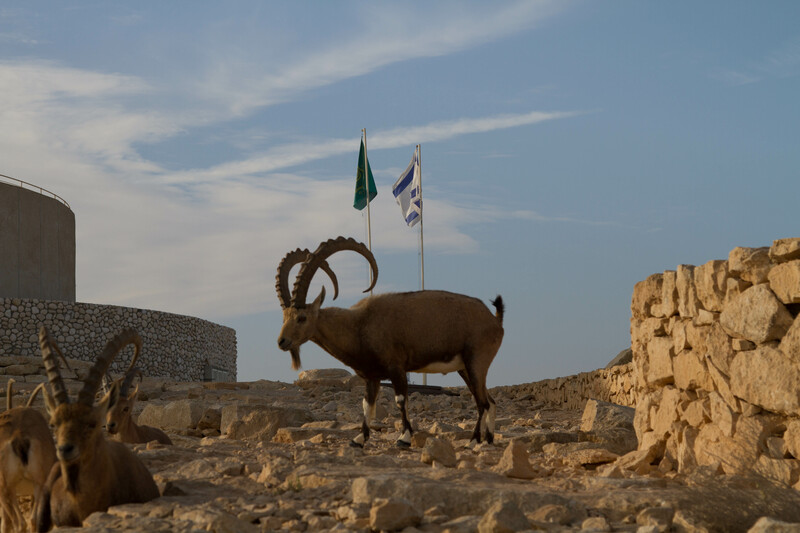 In recent years, the Maktesh has become an ecotourism destination and Mitzpeh Ramon, long a sleepy town of poor immigrants mostly, has now attracted many idealistic, crunchy granola, and modern Orthodox young pioneers. 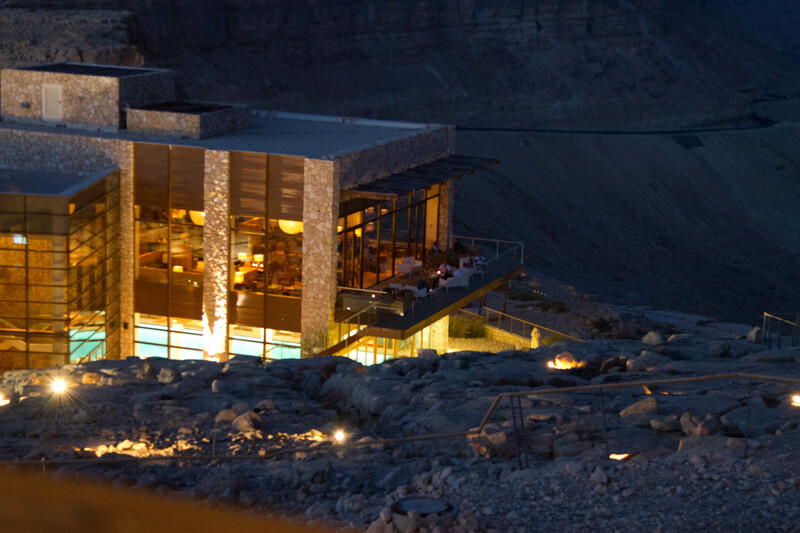 Last year, a luxury hotel called Beresheet (In the beginning, the first word in the Bible) opened on the rim. It is a gorgeous place, with low-rise stone buildings that fit in the landscape. The combination of incredible natural beauty and luxury is my cup of tea these days- a long way from sleeping on the beach in Eilat! Chuck got up at 5 both mornings we were there to go out and take pictures of the sunrise over the Maktesh. As you can see, it’s magnificent. 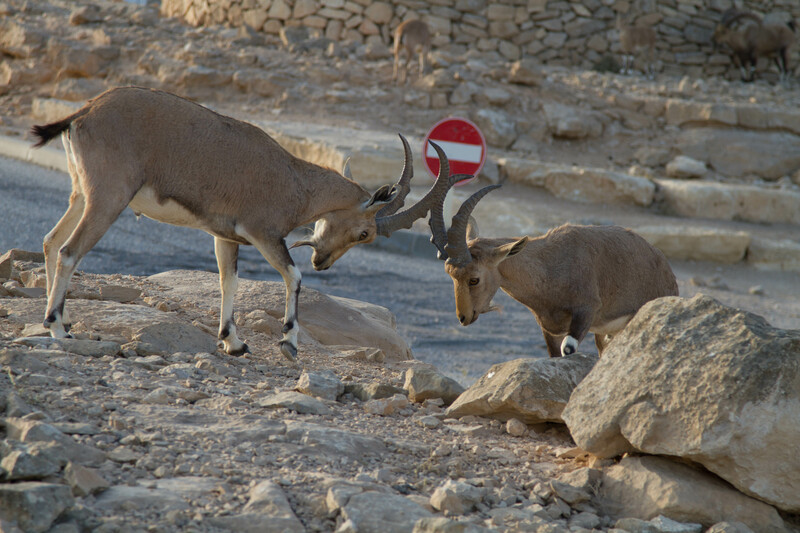 There were many Ibex around, with some interesting encounters between males and males and females, indicating it’s mating season. Enjoy the photos and don’t forget to click on them to enlarge them and to go to the sidebar to see more of Chuck’s photos once he gets them up on Flickr. On our first night there, we went out stargazing with Ira Machefsky, an astronomer who made aliyah a few years ago from Englewood NJ- following his daughter and her family who chose to be pioneer-type settlers in Mitzpeh Ramon. (Israel is such a young country that the original pioneers were only slightly older than my grandparents.) Here’s his website: http://www.astronomyisrael.com/ Although it was a nearly full moon and thus we couldn’t see the gorgeous canopy of stars I was hoping for, it was amazing to see the moon, Saturn and Jupiter through Ira’s telescopes and to learn about stars, constellations, and the night sky. The other feature in the sky that night was quite a scene- numerous Israeli fighter jets coursing and diving through the sky at amazing speeds and leaving their contrails of smoke. 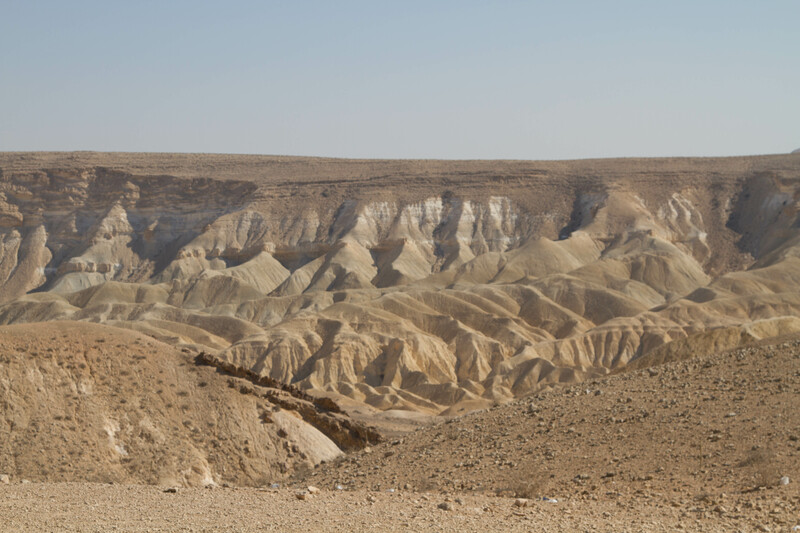 The Negev is the largest part of Israel, mostly uninhabited, and therefore the site of various military maneuvers. 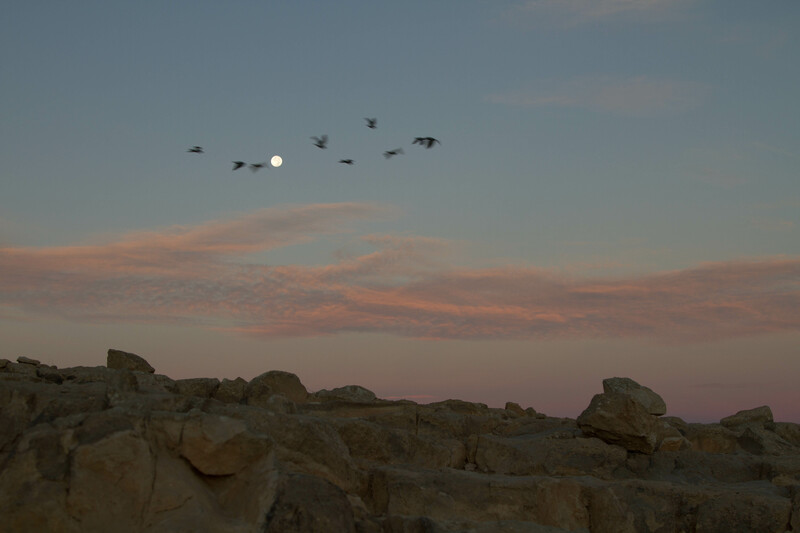 In any case, stargazing with Ira is a definite must-do should you find yourself in the Negev! The highlight of our time in the Negev was a 4 hour Jeep tour in the Maktesh with Itai Harary of www.deepdesertisrael.com. I looked up and corresponded with a few Maktesh tour companies before we left NJ, and somehow felt that Itai was the one for us. Boy, was I right! 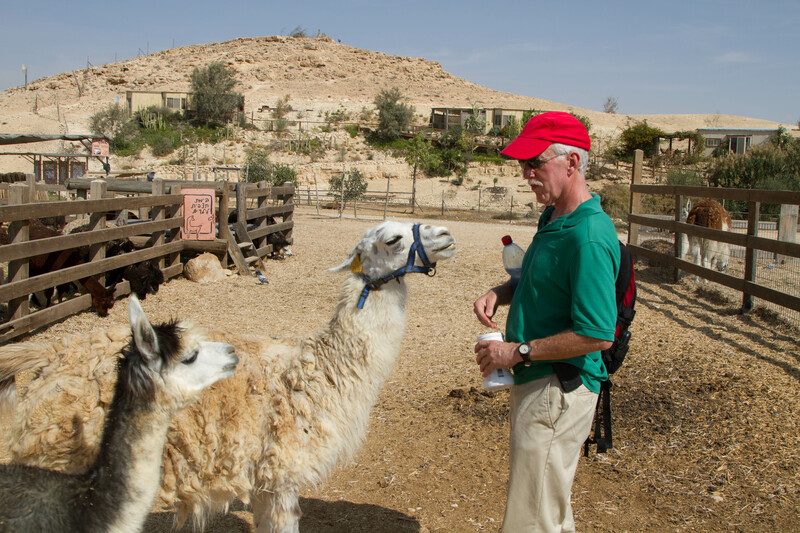 He explained that when he spent time there at the Field School before the army, he had a life altering experience and has been in love with the Negev and especially the Maktesh ever since. In the small world category again, when he heard I was an education dean, he told me had just guided Lee and Judy Shulman the week before. For those of you not in education, Lee Shulman is one of the most important researchers and policymakers in teacher education in the last 50 years and one of my heroes in my field. Then, as we talked, we found out that Itai was a graduate of Kibbutzim College, MSU’s partner teacher education institution in Tel Aviv, where I’m lecturing on Sunday, and he went to the first democratic school in Israel. Itai was a terrific example of the idealistic, passionate young people who have flocked to the area. He was a great teacher, using sand and water to show how the Maktesh was formed millions of years ago and his windshield to draw maps with markers. On top of that, he was a great driver over cliffs and rocks where I sometimes had to close my eyes! I couldn’t stop saying Wow- it was so breathtaking, fascinating, and informative. 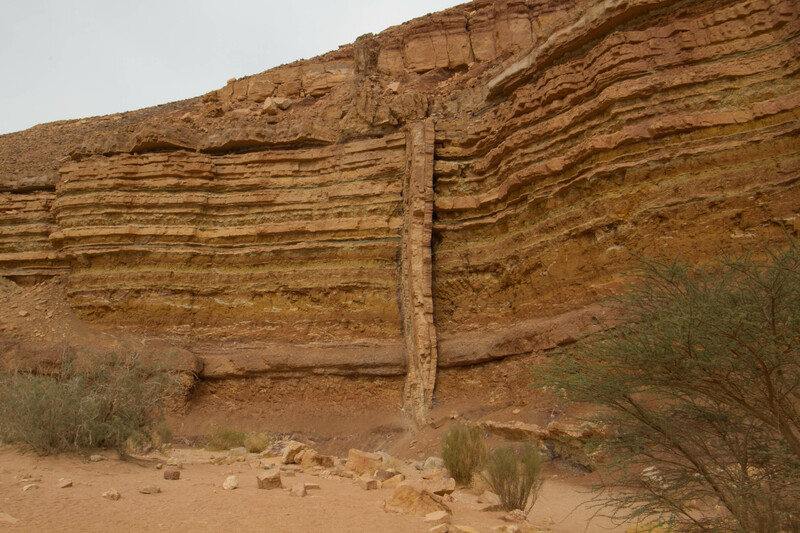 Next time you visit the Negev, do contact Itai for a tour. Needless to say, Chuck has many pictures, but here are a few. The last one shows a verrtical column of volcanic basalt that traveled underground through the rocks in rays and pushed out and hardened. Very cool. There was a tour group of South American/Israelis there and we joined them for their introductory lecture on the farm. What a hoot! First, the tour guide on the farm told the group how he lived in Spain for a few years and owns a farm there and with their encouragement, he went on a tangent talking about his experiences in Catalan! He switched into Spanish sometimes, but there was one woman in the group who had clearly married in and didn’t speak Spanish- Batya was her name-and she insisted he speak Hebrew to the groans of the rest of the group. 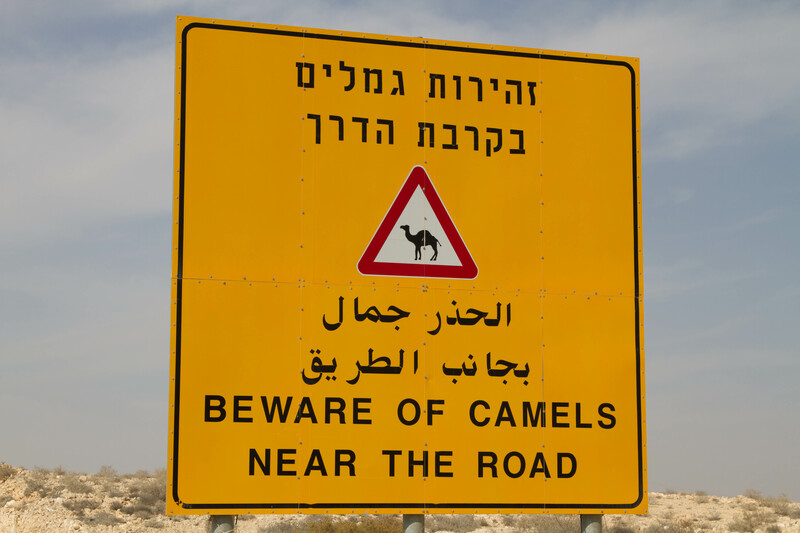 Only in Israel. 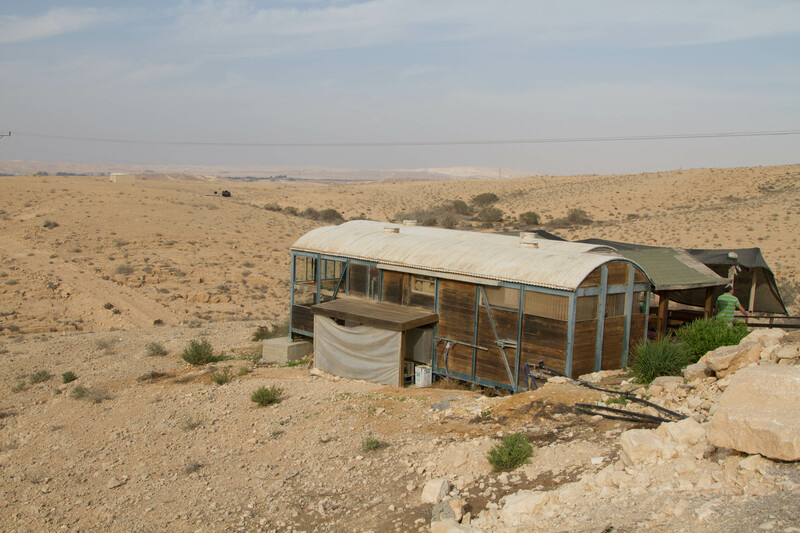 On the way home, we stopped at a godforsaken spot in the Negev where an Israeli couple, the Kornmehls, started the first family owned farm in the Negev in 1997 on the site of a Bronze age farm. They raise goats and sheep and make excellent cheese. We ate a delicious lunch (cheese dishes of course) at the restaurant and bought cheese to take home. They are now one of many young farmers and vintners who have settled in the Negev. I don’t think I would have considered moving to the Negev even when I was an idealistic young person, but I can still admire the passion and commitment of this new generation of Israeli pioneers.